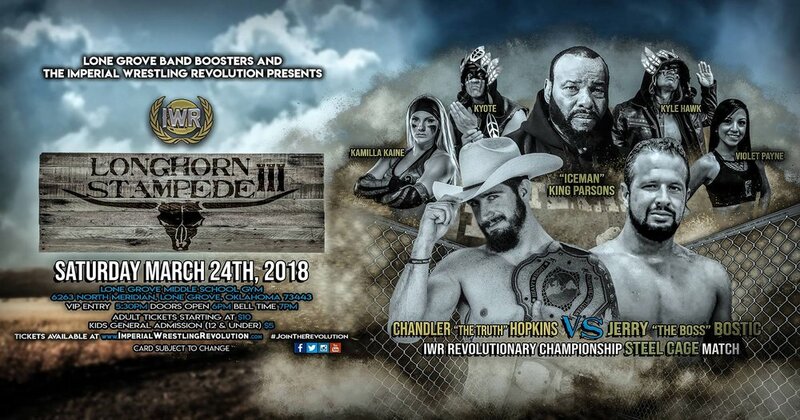 IWR presents "Longhorn Stampede III"
Don't miss the action as the IWR returns to Lone Grove! See for the first time ever IWR Revolutionary Champion Chandler "the Truth" Hopkins defend his championship inside a steel cage against former 2x IWR Champion Jerry "the Boss" Bostic as he comes out of retirement! The return of the legendary "Iceman" King Parsons to Oklahoma, Kamilla Kaine, the Arrow Club, and so much more!!! Glory Pro presents "Gateway to Glory"